The French motorcycle magazine, MOTOMAG reports on what seems to be a change of position from the French Government after the recent mass protests by French riders. The protests, regarding new traffic legislation proposals, included for motorcyclists the mandatory wearing of Hi-Viz. 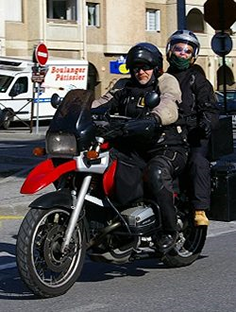 It is also reported that on French TV, the Interior Minister said that he had nothing against the motorcycle but that he intended to “improve their visibility because bikers are particularly vulnerable”. “It is not a question of asking bikers to wear a phosphorescent chasuble*” (Hi viz), said Claude Guéant, but “simply to improve reflecting devices that many of them already have”. 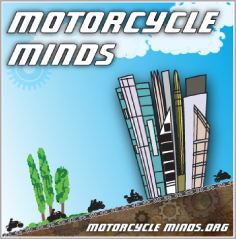 This is relevant as MAG Ireland face the possibility of mandatory Hi-Viz material for all motorcyclists in 2014, from their Road Safety Authority (RSA), subject to consultation on the most appropriate type of hi-vis material and possible solutions. At present we are trying to pin down the RSA for an answer, on how they perceive that mandatory Hi-Viz would affect riders from Northern Ireland and other countries visiting Ireland. *Note the nearest translation we can get for chasuble is – jumper, pinafore or sleeveless robe . Last minute: the Minister of the Interior supports filtering in traffic! (in French, Interfile). Report from www.motomag.com using various online translators. The interior minister, Claude Gueant, was interviewed on 12 October at 17:30, by the ‘parliamentary information mission’ on road accidents. There was surprise, when the right arm of the President noted that filtering in traffic (Interfile) by bikers deserved to be regarded with interest. The minister did not specify the mode of application of this measure, but filtering in traffic (Interfile) could be made legal on urban expressways in the coming months. The Minister explained that the number plates could be larger, so that riders do not go through the checks by safety cameras. “We discussed this with the associations of bikers, and have agreed on the German format, “said Claude Gueant. This format is 21×18 cm, as opposed to 21×13 cm which is current in France today. On two occasions the Minister of Interior highlighted the relationship between the government and representatives of bikers. But he did not mention the impact of events which had taken place on June 18 and September 10, 2011, bringing out between 80,000 and 50,000 people. It can be argued that these protests and debates have weighed in on the legalisation of filtering and a change from the mandatory yellow jacket toward a simple reflective strip. Meanwhile back in the UK, we don’t know how lucky we are…. However, the UK Government via the Ministry of Transport, has stated that there are no plans to introduce mandatory High Visibility clothing for motorcyclists in the UK and refers to the Highway Code which advises motorcyclists to wear High Visibility vests or jackets. Headlights on for motorcycles (AHO – Automatic Headlights On – no switch) has been a voluntary agreement by the motorcycle manufacturing members of ACEM (Motorcycle Industry in Europe) that the machines to be marketed in the European Economic Area, would be manufactured with an AHO specification from the introduction of their 2003/2004 models. There is no compulsion in the UK for any motorcycles to have their headlights on. View our other reports on the French Demonstrations.